Now that your summer months are filling up with plans for hosting picnics and barbecues, start the season right by giving your deck a thorough cleaning. A little effort now will let you enjoy your outdoor space all season long—and extend its life for years to come. 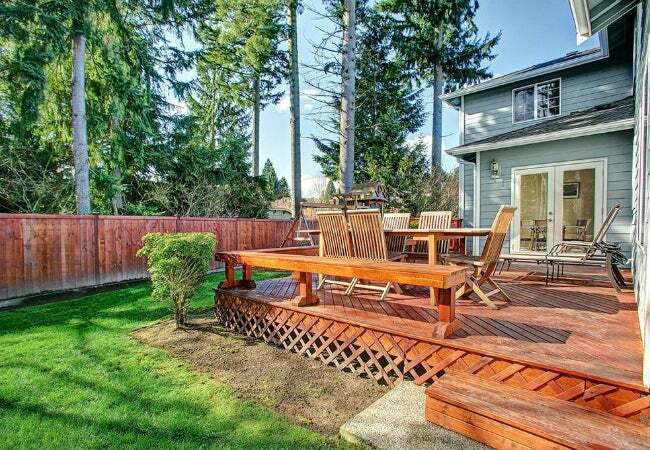 Come summertime, the deck practically becomes an extension of your house. In fact, when decorated according to typical interior design principles and tricked out with bright accessories, decks are often referred to as “outdoor rooms.” During the warmer months, the deck is where you drink your morning coffee, host barbecues, and may even set up camp to sleep under the stars. But before you launch into full outdoor-entertainment mode, take the time to clean your deck so that it will be at its best when the serious celebrating begins. 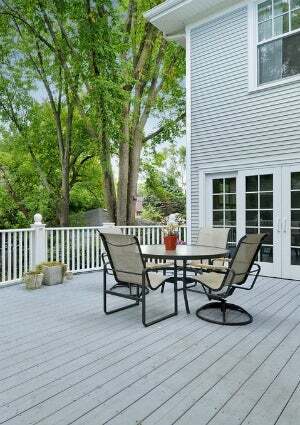 Cleaning your deck every spring will not only make it look nicer, but will also help it to last longer. It’s worth the effort. Your reward will be a fresh and welcoming place to kick back and hang with family and friends. Start by removing everything—all furniture, planters, and other accessories—from the deck. Then give the deck a good sweep with a broom, or use a leaf blower to blow off any loose dirt and debris that have settled over the winter. Cover nearby plantings with plastic sheeting to protect them from exposure to the deck cleaner as you go about the rest of the job. Pull out the deck cleaner, either commercial or homemade. If you’re making your own, be sure that the ingredients are effective on the soil and stains that you need to remove from your deck. A standard cleaning might require only soapy water, but best practices for halting mildew growth call for a cleaner that contains some kind of bleach or oxygen bleach. Whatever you choose, put your cleaning solution in a garden sprayer, apply it to the deck, and let it sit about 10 minutes. Be sure to coat all surfaces, including the railings and stairs. It’s best to do this in the absence of direct sun, so choose an overcast day or a time of day when your deck is shaded. Depending on the level of dirtiness and the type of cleaner you choose, you may need to use some elbow grease when washing down your deck. Grab a long-handled scrub brush with synthetic bristles for this task. Synthetic bristles will hold up better than natural, and the cleaning solution won’t cause them to deteriorate over time. Attach a spray nozzle to your hose and thoroughly rinse the solution off the deck with a strong stream of water. Hose down starting at the edge of your deck closest to the house and work your way out so the cleaning solution fully rinses away. Alternatively, you can use a pressure washer on a low setting—no more than 1,500 pounds per square inch. Be warned: Pressure washers can very easily damage a deck if used improperly. Be sure to use an appropriate pressure and tip angle to prevent gouging or fraying your deck boards. Let the deck air-dry completely. If you plan to seal the deck, now is the time to do it! If not, get ready to move all the pieces—your outdoor dining set and so on—back into place, and get ready to party.